Losing a loved one can be devastating, but you can always keep your friend or family member close to your heart, literally and figuratively. These Personalized Couple Gifts are hand stamped specifically to honor the memory of the person that you lost. Every time you wear this, that person will be with you in spirit. This romantic Sterling Silver Heart measures ¾”. It gracefully hangs from your choice of a 16" or 18" sterling silver ball chain necklace. 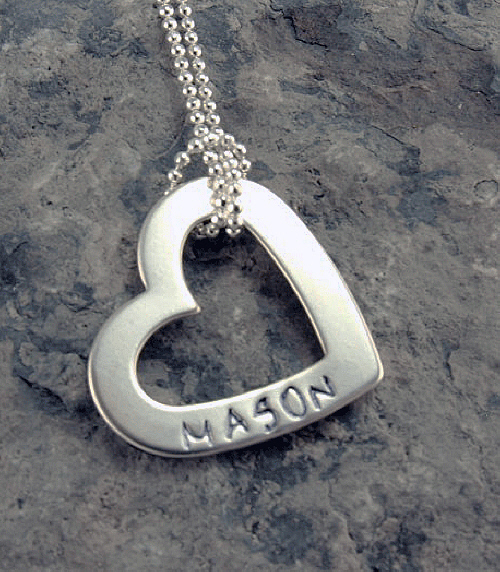 Free personalization of up to two names are hand stamped on the front or backside of the “V” on the heart. All Personalized Gifts for Couples are customized FREE and ship FAST! Chain Lenght: -Select Size- 16" 18"
Additional Details A personalized gift such as this one might not bring back a lost loved one, but it will serve as a source of comfort as you grieve through this difficult time. Our Angel Wings Hand Stamped Necklace is another gift option for those who have recently lost a loved one.